The Tudors were crowned Hertfordshire champions for the second time in three years on Tuesday night – courtesy of ANOTHER trademark free-kick winner from captain marvel Jordan Parkes. One magical swoosh of Parkes’ wand of a right foot was enough for Hemel to earn the win as he struck midway through the second half to send the Tudor faithful into raptures. 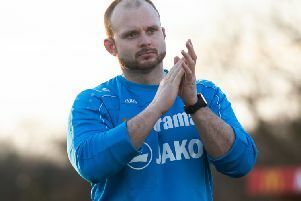 The victory was testament to the tenacity and resilience of the Hemel players who picked themselves up and responded excellently to Saturday’s defeat by Bishop’s Stortford which saw their Conference South playoff hopes come to an end. Fittingly, it was left to captain fantastic Parkes to lift the trophy for the second time in three seasons as the Tudors got revenge on title-chasing Boreham Wood following two league defeats this season.